I have been getting more and more inquiries regarding prior clients with regard to their mortgage companies. It appears that the mortgage companies are not reporting their timely payments to the credit bureaus. For this reason, I decided to address it in this blog. 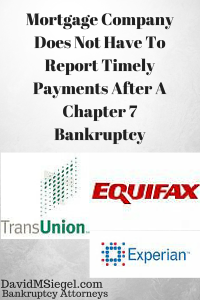 The bottom line is that your mortgage company is not required to report your timely payments once you file for chapter 7 bankruptcy and not reaffirm the debt. What you have is a unique situation whereby you still own the property and are allowed to make voluntary payments towards the debt. However, you are no longer legally obligated to make those payments. The bankruptcy code provided for reaffirmation agreements on specific types of property. Your homestead, real estate property was not one of those types of properties that mandated a reaffirmation agreement, redemption or surrender. The legislature was actually protecting homeowners although you might not think so when your credit report doesn’t reflect your timely payments. Here’s how you are protected after a chapter 7 bankruptcy filing when you do not reaffirm on a mortgage. You still own the home. You have the right to make payments to your mortgage company to be applied towards your outstanding mortgage balance. The upside is that if something were to happen to you in the future whereby you are not able to make your payments, the mortgage company’s only recourse would be to foreclose and take the property back from you. They would not have the ability to sue you for a deficiency judgment or a monetary judgment of any sort. This puts you the homeowner at a critical advantage in terms of keeping the property, yet not being on the hook for a deficiency should a problem arise. Many former clients are complaining that the credit report doesn’t reflect those timely payments that were made after the bankruptcy case was filed. I advise my clients to keep track of their payments, collect all of their mortgage statements, and be in a position to show a future lender or future credit issuer all of the payments that were made. That proof of payment should convince a lender that you are a better credit risk than not despite the fact that the mortgage company is not reporting those payments to the three bureaus. Clients just have to accept the fact that the loan was technically eliminated. Therefore, there is no reason to report the timely payments. Take advantage of other items on your credit report that show your good credit that do get reported. For the mortgage company that doesn’t report it, you have the proof of payment in your hand and the proof of the statements showing your balance being reduced each month. Regrettably, under the Fair Credit Reporting Act, there is no mandatory obligation for a discharged debt from a mortgage company to be reported as a timely payment after the filing. It is simply not required under the law and you cannot force your mortgage company to report those timely payments.